Meet Cindy, Matt and Phillip Hodges, three teenage siblings who are doing their best to cope with the divorce of their parents. Although they are siblings, they are very different people who are coping with the situation in their own way. Through a strange circular machine with its own personality that appears in the basement of their lake house, they are transported to a different world, a world where magic and science are one. 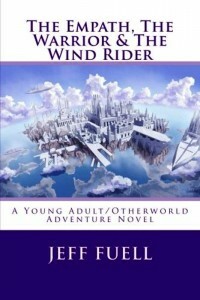 It is also a world where people have wings, can fly, and live in a magnificent, sprawling city floating in the sky. They soon find themselves involved in a religious war, their coming prophesized years ago in the Book of Origins as the Empath, the Warrior and the Wind Rider. With the help of Arion, a teenage sorcerer’s apprentice and the beastly yet strangely human Posdingo, they invade the floating city of Fastune to not only set free the Phoenix – The Daughter of God and this world’s version of Jesus Christ – but to also rid them of the evil Mephosi, a power mad wizard who has declared himself God. As the soldiers of two kingdoms collide in a terrible war they race to set this world back on a peaceful path. But then, a choice must be made. Once it is all over, will they stay here on this wonderful world filled with people they have come to love and consider family…or return home to a family that is broken? Like any of my books, I had to the idea for it and I wanted to explore it and see how it would come out. Even though I pretty much had a general idea of what would happen there were a good deal of surprises. My characters take on their lives as the story unfolds. As I write I find out more and more about them and the become fully fleshed out. Phillip and Matt turned around and their eyes widened. Floating five feet from the ground and twenty feet away was the Circle. “Oh, Christ! What is that thing?” Matt barked, now pressing against the wall. “Don’t be scared of it, it won’t hurt you,” Cindy said. Phillip looked at it enraptured, his brow furrowed, not saying anything. “Won’t hurt us? What do you mean it won’t hurt us? It’s a…thing!” Matt yelled. The Circle swirled its lights as if saying hello. “No, it wanted to get all of us together, but not to fry us,” Cindy said. “What do you mean, Cindy?” Phillip asked. Cindy explained her theory of why she had been able to see it earlier but they couldn’t, because of their mother being in the room. She then went on to explain that she now felt connected to it somehow because of what she had experienced a few minutes ago when she was down here alone with it. “Will you stop saying that?” Matt complained. Phillip moved towards it, Cindy following him. “Don’t be scared, Phillip. It won’t hurt you,” she said. He looked in the center of it, a constantly roving void of endless space. “Would you mind saying that in English?” Matt asked. He had worked up the nerve to approach it and was now standing beside them. “I think it’s pretty,” Cindy said admiring it. The Circle must have appreciated the compliment because it twirled its lights again. “Excuse me. I don’t mean to rain on your parade or anything, but have we forgotten the point of this? Namely, what is it doing here in the first place?” Matt asked. Cindy and Matt smelled the air for a moment. “It smells kind of like grass,” Cindy offered. “Yeah, it is kind of weird. Maybe it’s broken or something,” Matt said. “I don’t think so,” Phillip replied, his forefinger resting on his chin.